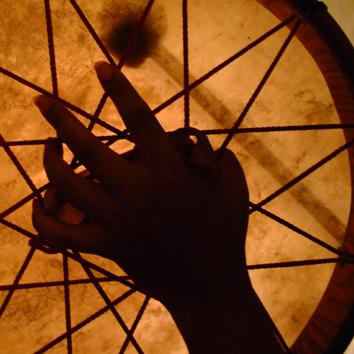 When I was taught how to Journey, the Shaman played a drum. I was not prepared (sound wise) for what I was about to experience. A bit of personal history is in order…. First, I am a musician. I’ve been involved with musical instruments since I was a child and I’m pretty much, self-taught. When I was 17, I picked up the guitar, learned to tune it, played along with records and built up quiet the ear. About a year before this, I got deeply involved with competitive cycling. By the time I was 18, I was riding in Olympic Development events aiming for, the Olympics that the USA banned in Moscow. Anyway, my conditioning then gave me a resting heart rate of 38 b.p.m. What this did for me musically, is it made slow music very natural for me and when I would compose or play, my music would (and is) very melodic, meditative and mellow. Bounce forward in time…and I’m sitting, ready for my first Journey. My personal rhythm (if I were to just tap on a table top with my eyes closed) is around 45 beats per minute. Named The Eagle’s Heartbeat, the Shamanic beat runs between 3 and 4 beats…per second! That is 180-240 beats per minute! It has been found that this tempo induces the mind into the elusive and mysterious Theta state where brain activity slows almost to the point of sleep. Theta is the brain state where magic happens in the crucible of your own neurological activity. It brings forward heightened receptivity, flashes of dreamlike imagery, inspiration, and your long-forgotten memories. Theta can bring you deep states of meditation and a sensation of “floating.” Because Theta is an expansive state, you may feel your mind expand beyond the boundaries of your body. Now when I drum, I want to hop right into the 180-240 beat per minute pattern! Once it gets into your soul…oh boy! There is far more to the drumming that just a fast tempo. I’ll go into more depth in an upcoming article….